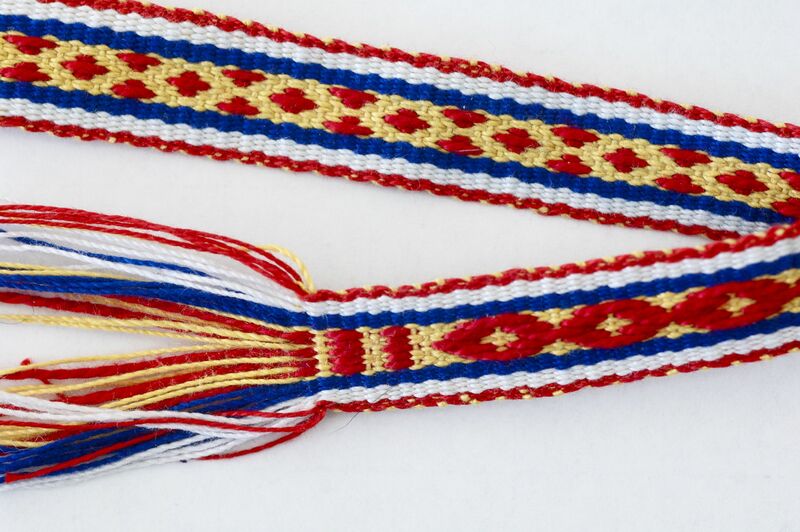 Many of the members of our Scandinavian Weavers Study Group have lifelong experience with weaving; others are on the beginning path of weaving study. Keith Pierce fills both categories. His initial experience with weaving dates back to a unit in ninth grade shop class, when he wove a runner in overshot technique on a table loom that was only about 15″ wide. Years later, after marriage but before kids, he picked up “Byways in Hand-weaving” by Mary Meigs Atwater. He learned tablet and inkle weaving and a few other off-loom techniques. 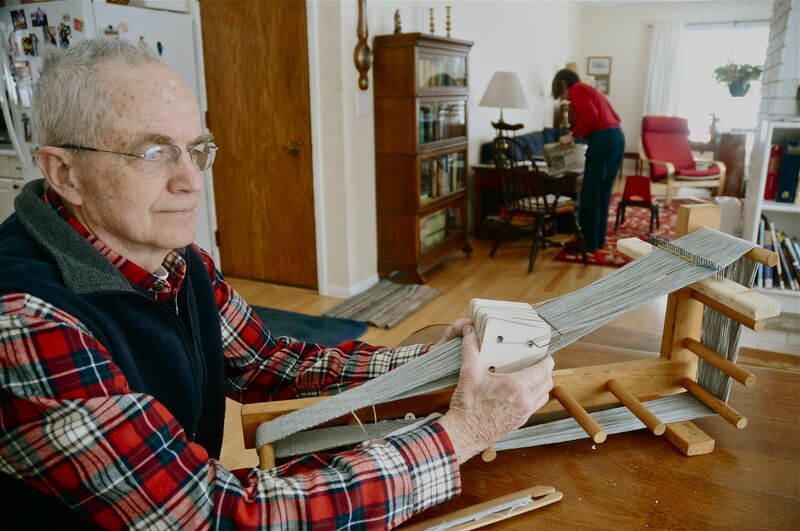 Over the next four decades he wove on his Beka inkle loom, punctuated with large gaps as more pressing matters intervened, like job, family, and adding bedrooms to his house. About a year and a half ago Keith revived his weaving hobby and started working through Peter Collingwood’s book, “Techniques of Tablet Weaving”. 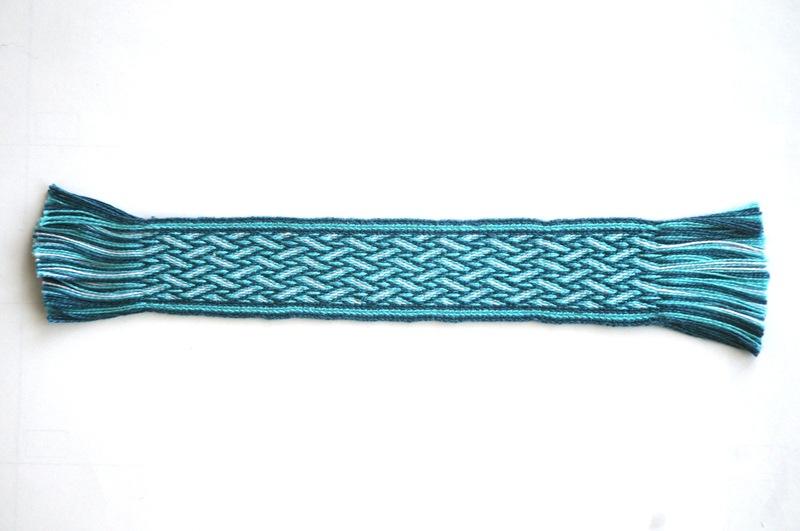 He wanted to try weaving a belt using double-face 3/1 broken twill, his first attempt with that technique, and settled on the double-helix pattern that he found on a Danish web site. It was inspired by iron-age bands with helix motifs found at sites in northern Europe, for example at Mammen, Denmark and Elisehof, Germany. Peter Collingwood describes 3/1 broken twill as “the most challenging of the double-faced weaves.” While the technique was challenging, the choice of materials was easy. Keith said, “I used some green, black, and red 5/2 perle cotton from the stash that I dragged around the country for 40 years.” His materials at hand worked well for the band. “I enjoy working with Perle cotton. It’s strength, smoothness, and durability make for painless weaving. And it produces a pretty, lustrous fabric.” He explored further, to great success. His second band in 3/1 broken twill won a Sweepstakes ribbon at the Minnesota State Fair in 2012. The photo below shows the front and the back side of Keith’s double-helix band in the show. 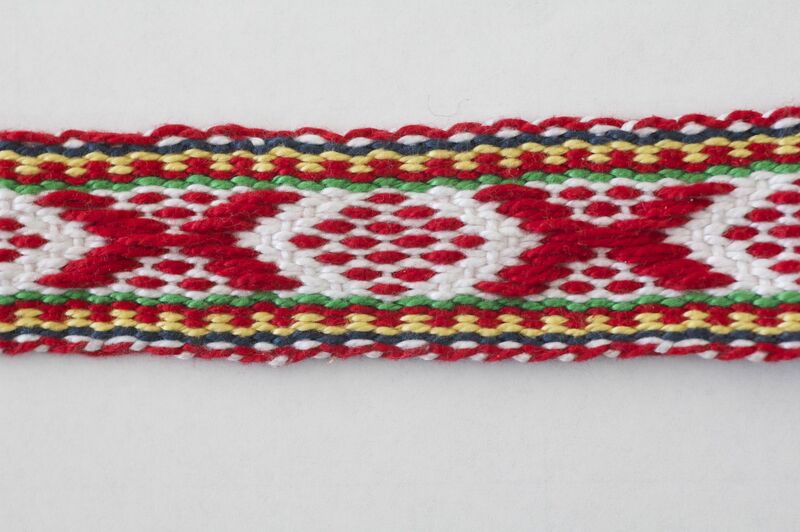 Keith has two Sami bands woven in perle cotton in the current exhibit. 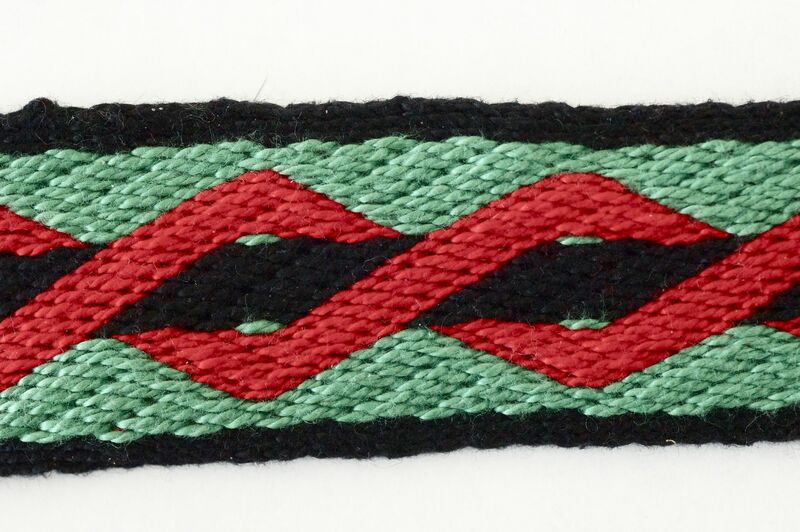 The background in the narrower card-woven band used 10/2 and pattern used 3/2. The wider band used 3/2 for both, but doubled the pattern threads. 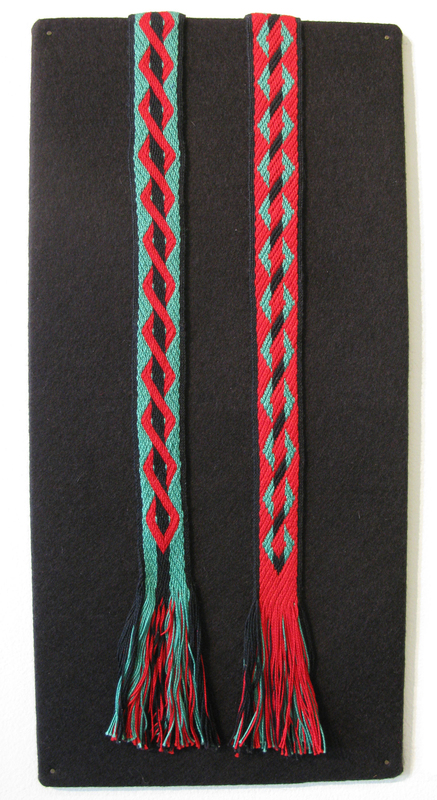 The patterns are taken from the book “Sami band weaving” by Susan J. Foulkes (self-published and available at blurb.com). It was woven using a traditional hand-held heddle. Also in the exhibit is a blue bookmark woven with 10/2 Perle cotton. Its pattern has Scandinavian origins as described in “Viking-Style Tablet Weaving: Birka Strapwork Motif” by Carolyn Priest-Dorman. She writes, “The motif for this tablet-weaving “recipe” is based on a Viking Age brocaded tablet-weaving pattern found on Bands 22 and 23 at Birka, Sweden. 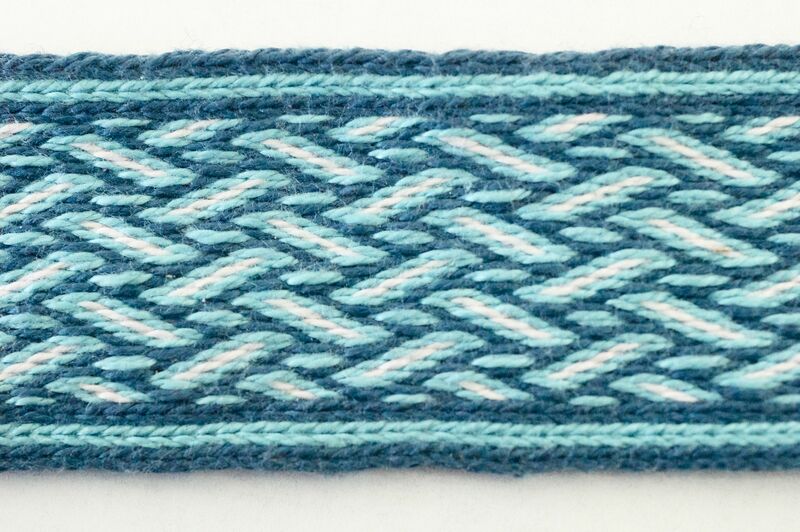 Based on both the number of finds of brocaded tablet-weaving finds and the total weight of metal brocading weft found at Birka, this was the trim pattern most commonly represented in Birka’s Viking Age burials; its popularity spanned the ninth and tenth centuries.” Keith notes that this pattern has been used by many band weavers – just google the term “birka strapwork” as evidence. (not Krokbragd). Read Keith’s detailed notes here.